I finally found someplace where I could order the Tosh Merino Light in the color I really wanted for a sweater, Eat.Sleep.Knit. 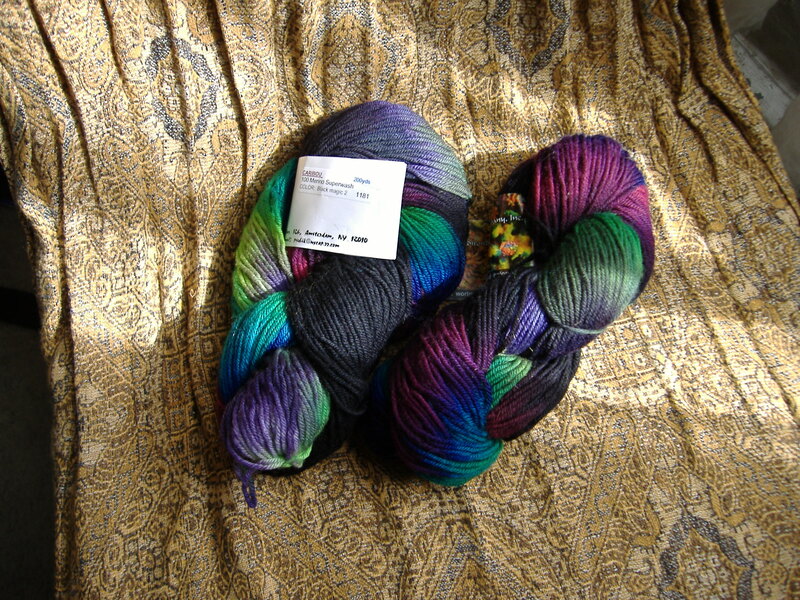 It was more expensive than other places I’ve seen Tosh Merino Light listed, $21.00 a skein to the $19.00 my LYS Loop charges, but it’s so hard to find any Madelinetosh in quantity that I just went with it. My order got here super fast too, just three days turn around. 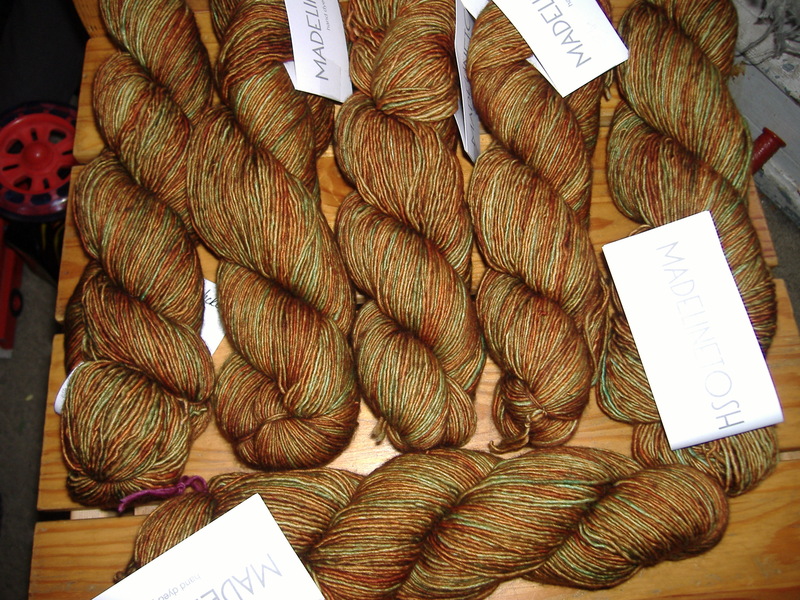 It’s the Golden Hickory colorway (the same as the Pashmina that I got at Knitty City) and I love it. I’m planning another top-down raglan with a boat neck, 3/4 sleeves, and tunic length. 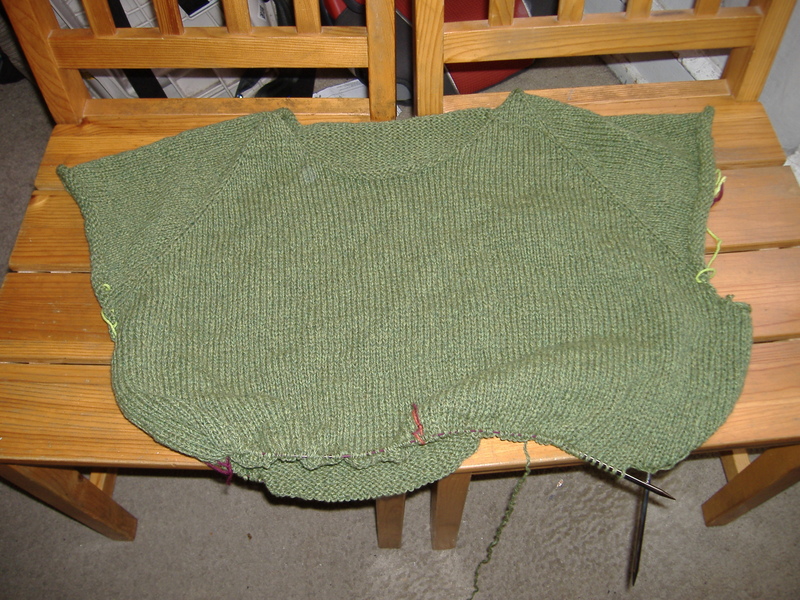 Of course I have to finish the green sweater before I cast-on for another big project, so I’m hoping to get those sleeves done this weekend. As if yarn wasn’t good enough, I got a little “Yarn Lotto” card with my order and I won a $50 store credit! So who knows, there may be another Tosh sweater in my future. 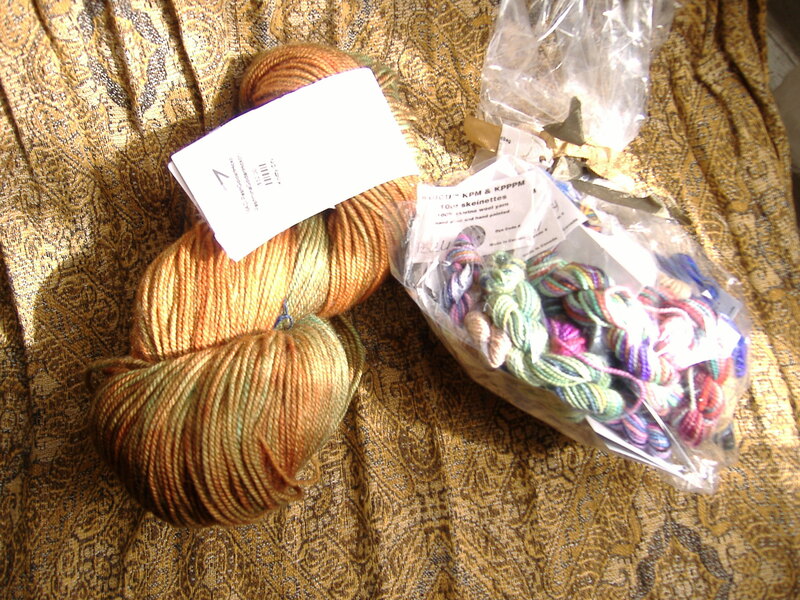 They also sent two mini skeins which I can use on my sock yarn blanket. In other news, the socks I’m making from the Great Adirondack Yarn Co Caribou are coming along nicely. 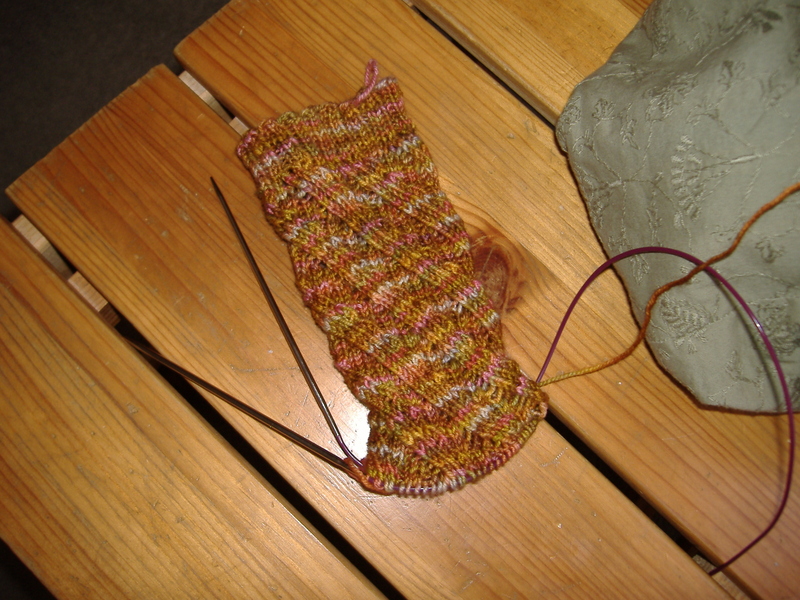 I’m just about finished the gusset so I should have the first sock finished by the end of the weekend. 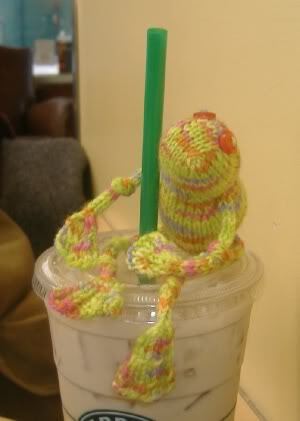 I’ve also decided I’m going to frog the Rick sock. 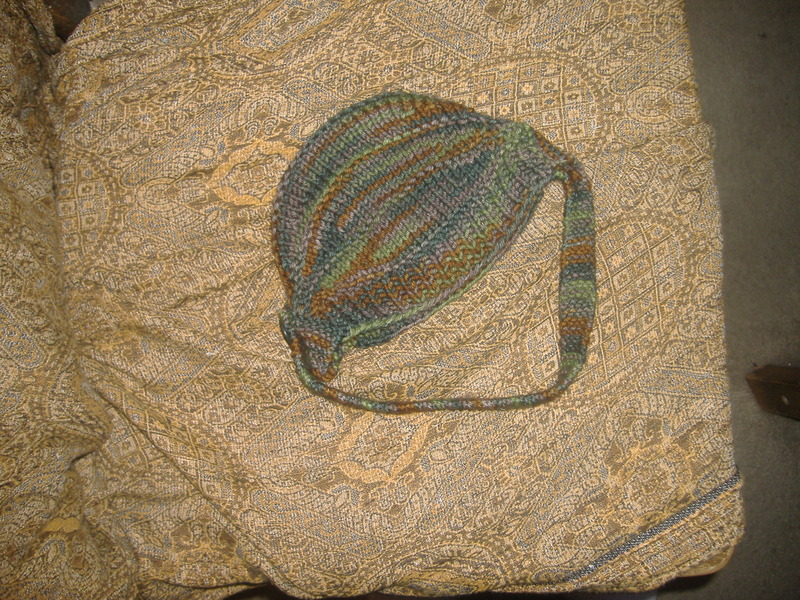 I’m just not happy with the way it’s turning out and the unevenness of my yarn overs. 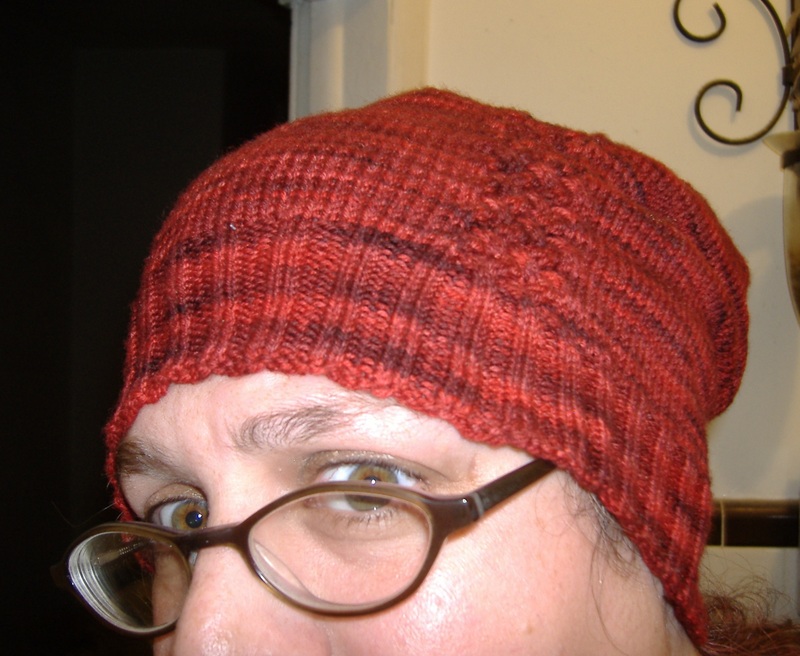 I’ll have to so some searching to find another good pattern to use with the Manos Alegria yarn. My long awaited yarn crawl of New York happened yesterday and here’s the woolly goodness I brought home with me. First stop was Knitty City. They had an incredible selection of yarns from ultra high end blends all the way down to Sugar ‘n Cream cotton. The staff was super nice and they even had a “man” chair for my husband to sit and read in while I shopped. I found 5 skeins of Tosh Merino Light in Stephen Loves Tosh for a sweater but I was unsure of the color (it was mostly golden yellow with a bit of purple). 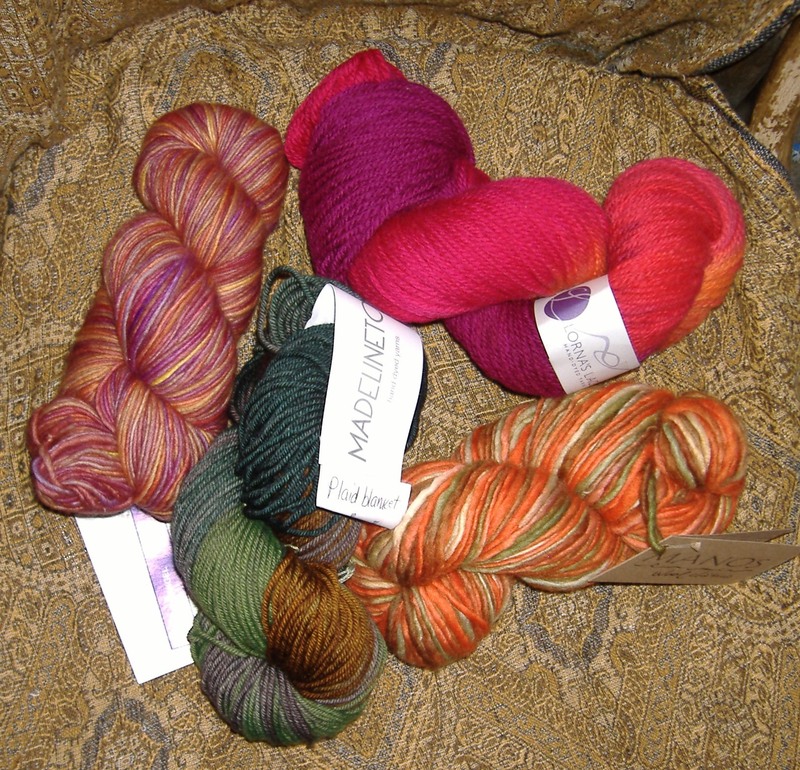 I decided I would wait on it and check out the other store in the area, The Yarn Company, to see what they had. We walked over to the Yarn Company but they weren’t open yet so we hung out at Starbucks for a coffee and a morning bun. I talked to my mom while we were there and we both agreed that I couldn’t pull off yellow so sweater yarn from Knitty City was off the table. After we were finished, we walked over to The Yarn Company. I have to stay I wasn’t super impressed with the selection. It was mostly high-end yarns. They did have some Three Irish Girls and the Verdant Gryphon as well as some other exclusive yarns, but nothing really called out to me. The store itself was very neat and organized, not like the barely controlled chaos of Knitty City. I did end up making a purchase, some Great Adirondack Yarn Co Caribou superwash merino in Black Magic II which is a sport weight in 50g hanks. It was much more than I would usually pay for sock yarn, but I really liked the colorway. We walked back over to Knitty City and there I grabbed a hank of Madelinetosh Pashmina in Golden Hickory (the colorway I really want to use for my sweater) and a bag of Koigu KPPPM mini skeins for my sock yarn blanket. We hit the Lego store for the kids (and my husband) and then had Korean for lunch. Our next stop was School Products Yarn. Now if you’ve ever been, the store is not much to look at. They carry a lot of imported yarns and some unusual fibers ( I still have a ball of baby camel from my last visit three years ago that I have yet to do something with). I was hoping to score a cone of their Provence Lace Merino like I did three years ago, but they didn’t have any. 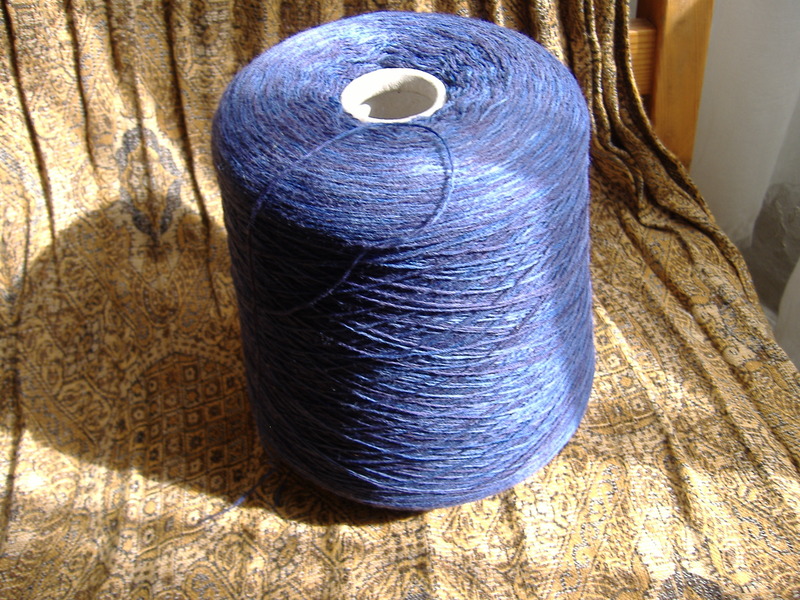 I did buy a cone of the Lace Merino in a very pretty blue. The cone is a pound and a half so that works out to be 5,100 yards of yarn for $39.00. It’s definitely worth a stop to see what they have on hand. We did a bit more shopping and then ended up at Purl Soho. It was nice, reminded me a little bit of one of my local LYSs, Loop. They had a decent selection of yarns and in quantity as well, They were all arranged in the front of the store so you had to use a ladder to reach the upper cubbies. There was also fabric and sewing notions in the back of the store. I had some hope of finding my Tosh Merino Light, but they only had semisolids. It was fairly crowded when we got there so I just didn’t have the patience to try and find their sock yarns. If I’m in the neighborhood again, I’ll probably pop in for a quick visit but I don’t think I’ll go down there just to stop at their store. There are a lot of places that I just didn’t get the chance to visit or were closed. Seriously, who’s closed on a Saturday? I’m hoping to attend Vogue Knitting Live next January which should keep me busy enough that I won’t have time to visit any place else. 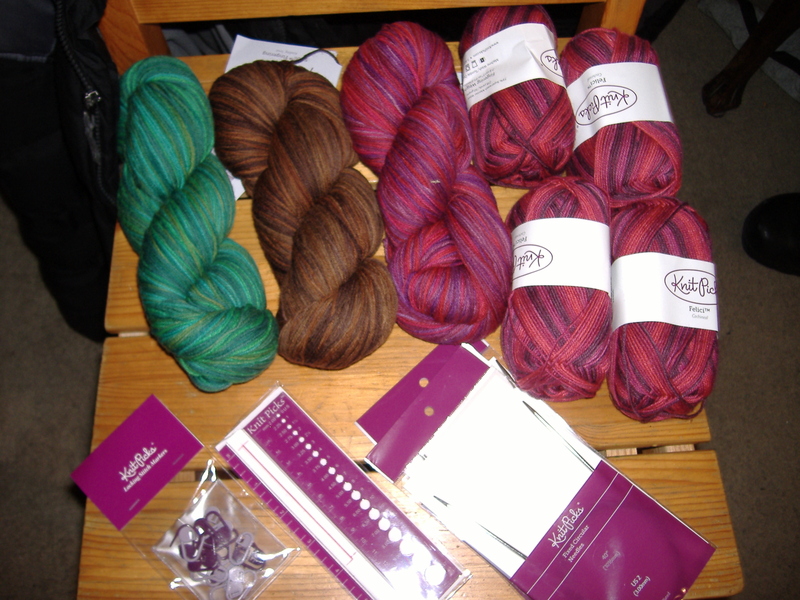 All in all, I’m pretty pleased with my haul but a little bummed that I couldn’t get my sweater yarn. 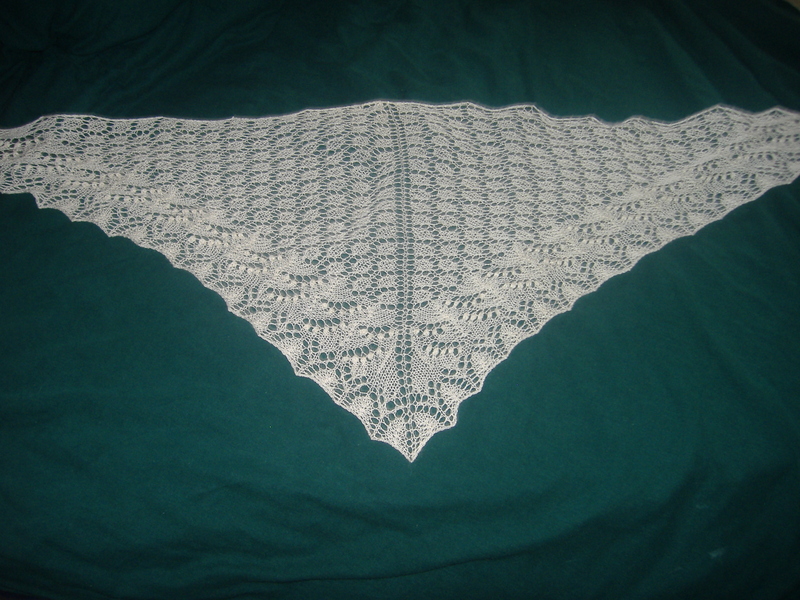 I already have plans to do Citron with my Lace Merino but I’m already dreading all that purling. I’ll have to look through my queue on Ravelry to find something to do with the rest of it, maybe something Estonian, I have a love affair with nupps. 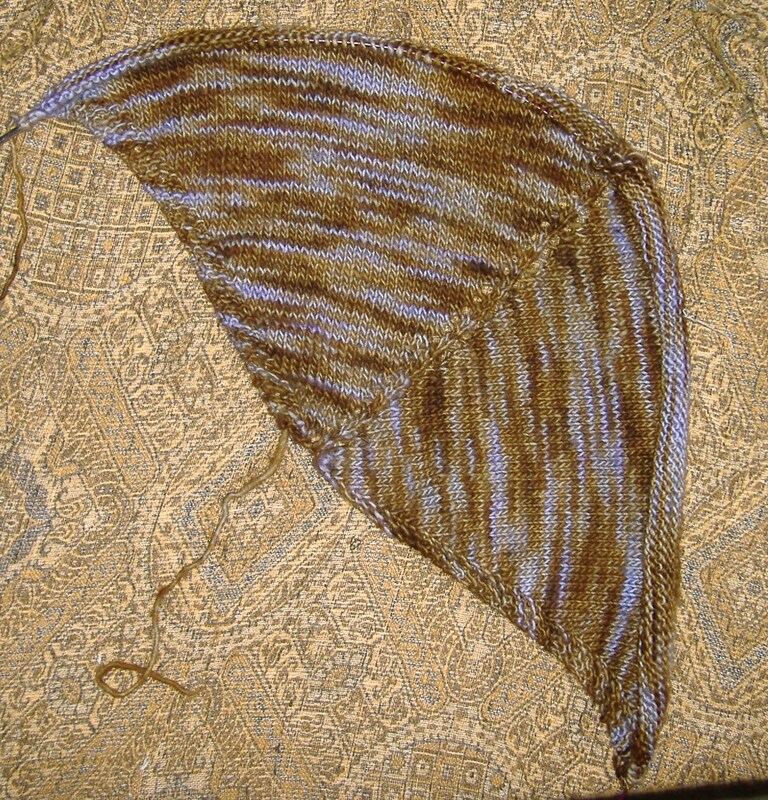 Even after that, I should still have enough for another shawl, if not two so we’ll have to see. And fluffy mail too (which is for socks). I succumbed to KnitPicks sock yarn sale and bought way too much yarn, but it’ll keep me in socks for some time to come. The first three are Stroll Tonal in Canopy, Kindling, and Wine Tasting. The Kindling I am planning to use for Salted Caramels from the Knitter’s Book of Socks. I don’t have plans for the other two skeins although I may try Veil of Rosebuds in the Wine Tasting. A friend of mine is sure it will be stretchy enough to fit my feet so I’ll have to wait and see. I also got 4 balls of Felicic Self Striping in Cochineal to make myself a pair of stockings. I’m hoping I can get them done in enough time to wear them this spring while it’s still on the chilly side, but if not there’s always next fall/winter. 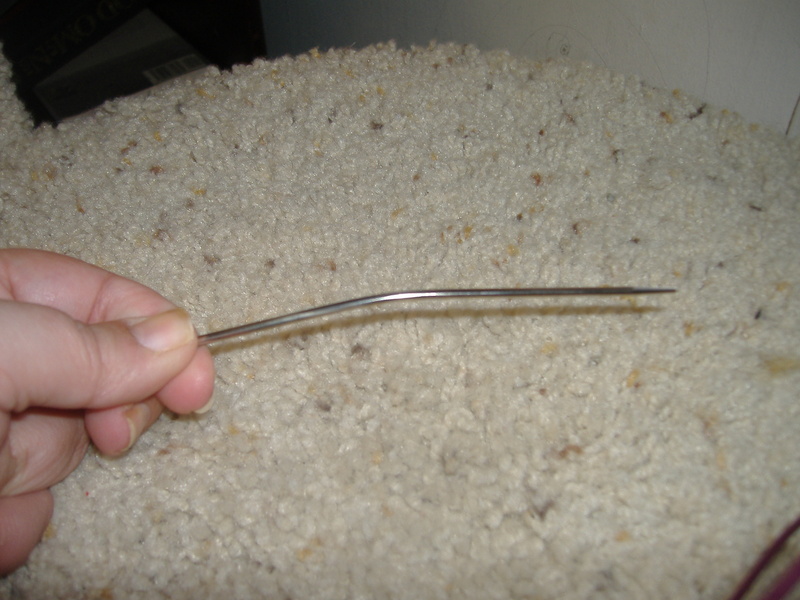 I also got two 40″ fixed circulars in a US Size 2.5 (3.0mm) and US Size 3 (3.25mm). I’m using the 2.5s on my current project and I’m only seeing a slight difference between it and my Addi size 2.5. 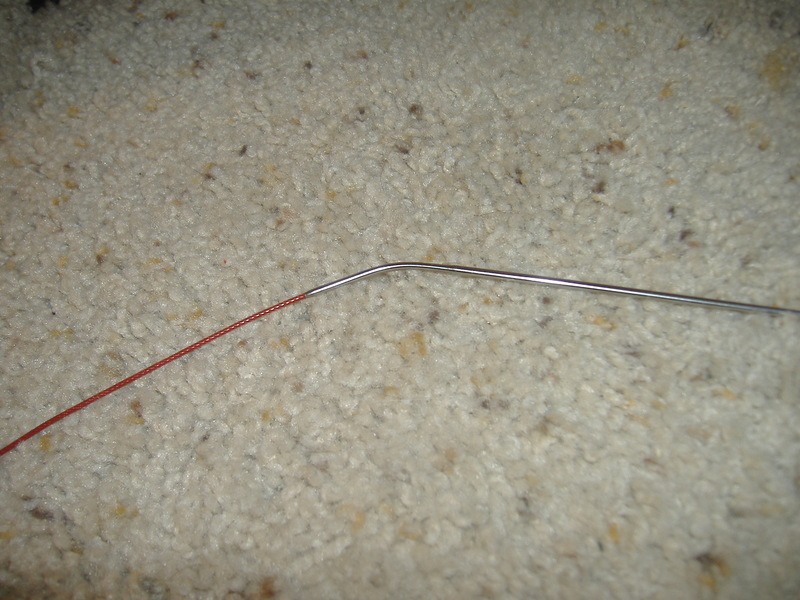 The cable is a bit more flexible on the KnitPicks needle and the stitches slide a bit better (but that’s because it’s not worn like my Addi needles). 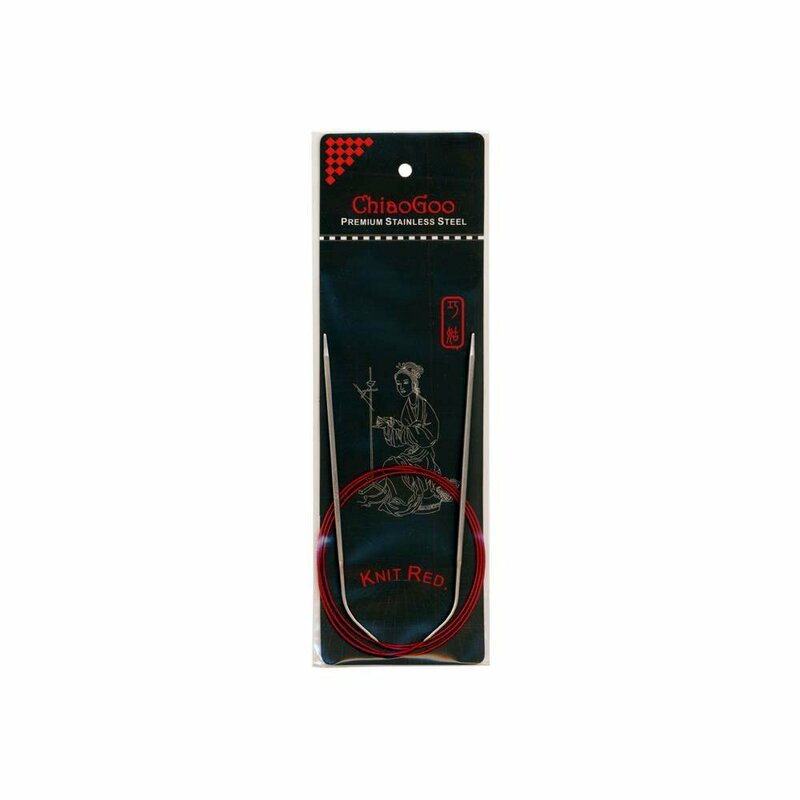 While there is a definite difference between the Addi size 1.5 and the KnitPicks Size 1.5, the 2.5s are much closer. I’ve heard tell that Addi has come out with dedicated sock needles. I’m going to try and pick up a set when I go to New York City next week to I can test them out. Oh, and did I mention I’m going to New York City? I’ve had the trip planned for almost a year as a birthday present to myself. My husband will be tagging along while we got to different yarn shops in Manhattan. Our first stop will be Knitty City for hopefully a sweater’s worth of Tosh Merino Light. Then we’ll hit The Yarn Company, swing down to Korea Town for lunch and walk over to School Products Yarn to see if I can score a cone of their Provence Lace Merino for another sweater and maybe a shawl too. After School Products, we’re headed down to the Village to hit a few shops and Purl Soho. Hopefully the husband won’t be too bored by the end of the day, but he has his e-reader and will just find a corner to read a book while I shop. Here’s my sweater. 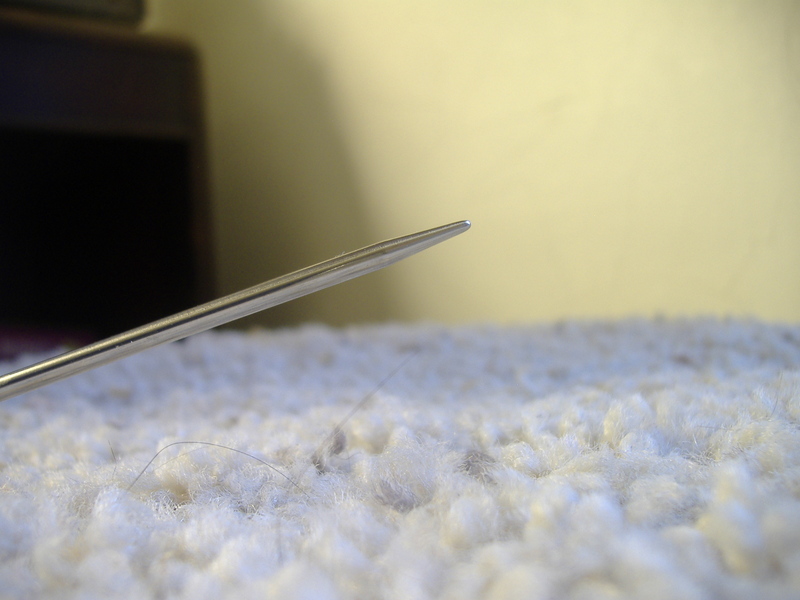 I picked up a 16″ US Size 9 (5.5mm) HiyaHiya needles to use for the sleeves. I know I could have done the whole thing using magic loop, but I tend to pull the end stitches a little too tightly and I don’t want a line of tight stitches running down the whole length of the sleeve. I started decreasing the body stitches and am almost at the end of my third ball of yarn. 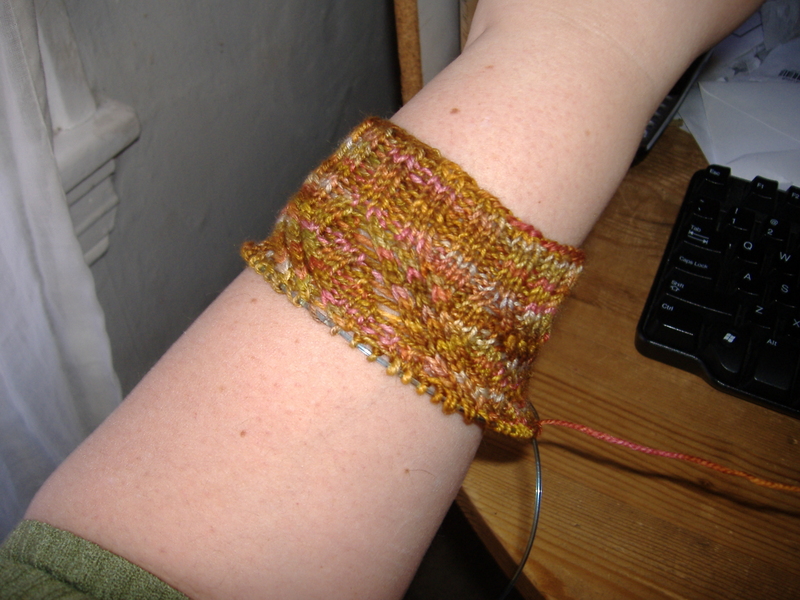 I think I’m going to do the sleeves 3/4 length because I’m really afraid I’m going to run out of yarn on this one. I don’t think that I will, but I’d rather be safe than sorry. The reason why I don’t have at least one sleeve done is because I’ve been working on a sock. 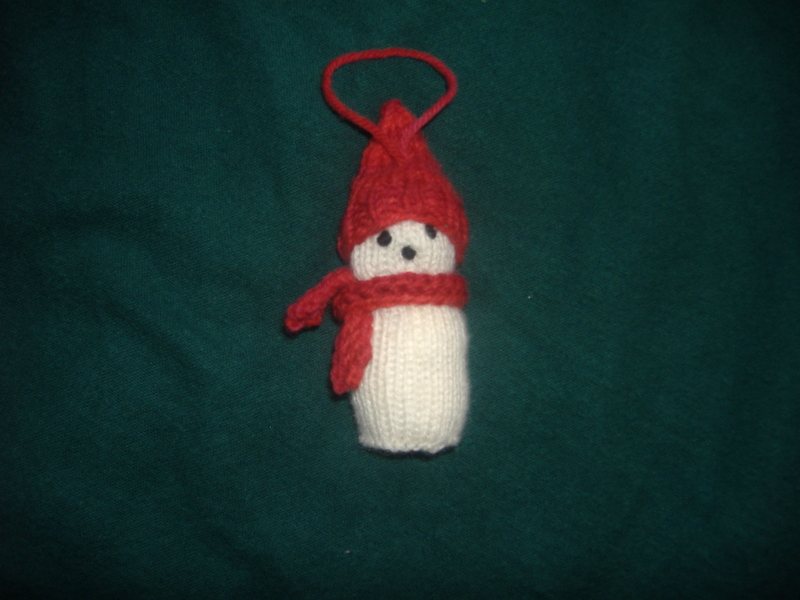 This is the Rick sock pattern by Cookie A from Sock Innovation. I wanted to do something different from a standard lace sock and this yarn is too colorful to really do any of the patterns I liked from The Knitter’s Bock of Socks so after much debate, I chose Rick. The yarn is Manos Alegria and I’m really liking the way it’s knitting up. 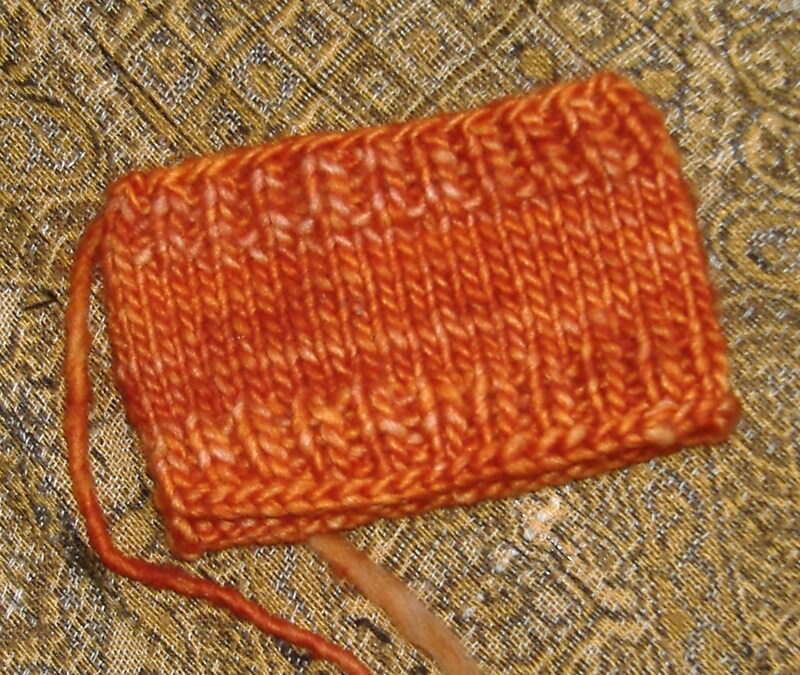 The yarn has a great feel to it and a nice sheen. I’ll definitely be using it again. 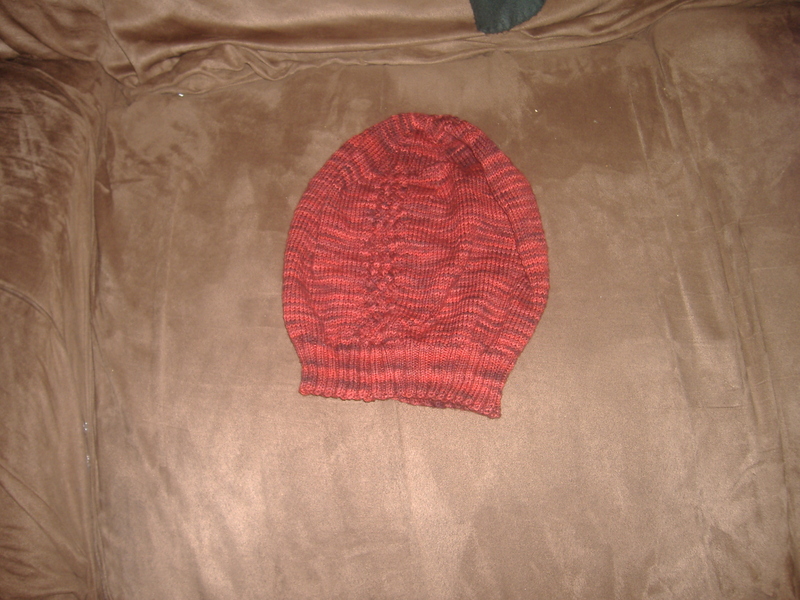 I altered the pattern by adding another repeat to bring the total stitch count up to 72. I’ve found several other people who have done that on Ravelry in the project pages so I have some guidance on how to do the heel and the instep. I’ve just finished the leg and am getting ready to start the heel flap. Depending on my mood, I should have this finished by the end of the week or my sweater may have sleeves.